Custom designed Avocent'switchView SC (10080SC-AM) increases the levels of secure KVM switching and provides controlled access for up to eight computers. The Avocent Avocent SwitchView SC design makes it impossible to transfer data between the connected computers --- an important factor for a user who may access secure and non-secure networks from one point of contact. 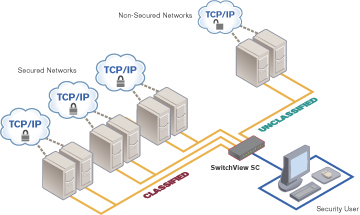 With Avocent's LongView extension technology, critical computers and other related assets can be located in secure (locked) areas allowing for controlled access with the SwitchView SC. The versatile Avocent'switchView SC 8-port model provides secure access at desktop or from the rack. The space saving desktop model also doubles as monitor stand.